Designer Mary Douglas Drysdale uses balance to contemporize this Maryland home, featured in House Beautiful. Why we love them: Mid-century furniture is always in style. This set of two chairs features impeccable styling with a nod to Hollywood Regency style. The curved shape, tufted back, and luxurious upholstery make a standout addition to a room. Place the chairs directly across a larger sofa to create a stylish conversation grouping. 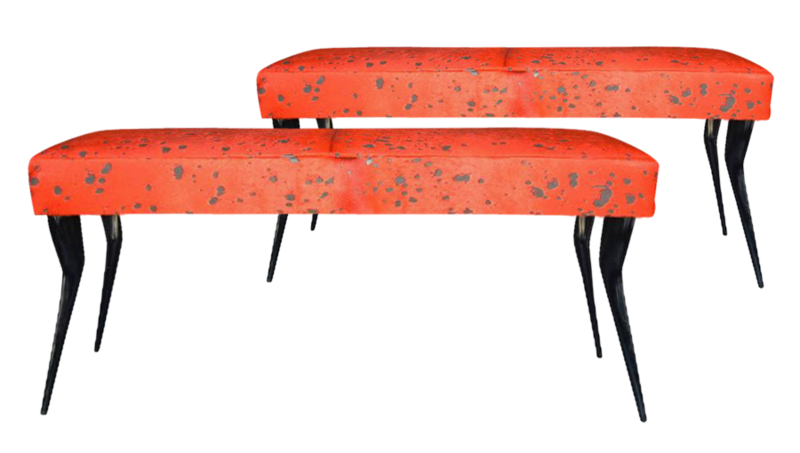 Why we love them: Dating back to the 1970s, these Italian-designed benches are simply fabulous. We especially love the bold red-dyed cowhide upholstery and the shapely legs. Use this pair as an unexpected seating option for a dining table. Why we love them: The detailed base of each table is a stunning representation of traditional Indian elephants. Even better, the set was curated by Hutton Wilkinson of the revered Tony Duquette Studios. The cast iron bases and glass tops mean that the set could go outdoors; but the pair would also be a charming choice for a living room or sunroom. Why we love them:Â It’s all about the frames: Carved details and a burnished gold finish lend a classical quality to this mirror set. The set also has very dramatic proportions, measuring in at almost 67″ in height and almost 45″ in width. If you have the wall space, these would look stunning when placed on either side of a great fireplace. Why we love them: Another standout example of mid-century design, this whimsical set of pendants has eye-catching appeal. Each has a glass shade that’s decorated with a fanciful blue and red swag design. Position them together over a table, or use them instead of traditional sconces or table lamps for a very unexpected look. Shop more perfect pairs on Viyet!